With Lieutenant Packs for Descent: Journeys in the Dark Second Edition, you can replace the game's lieutenant tokens and bring the overlord's most powerful agents to life. 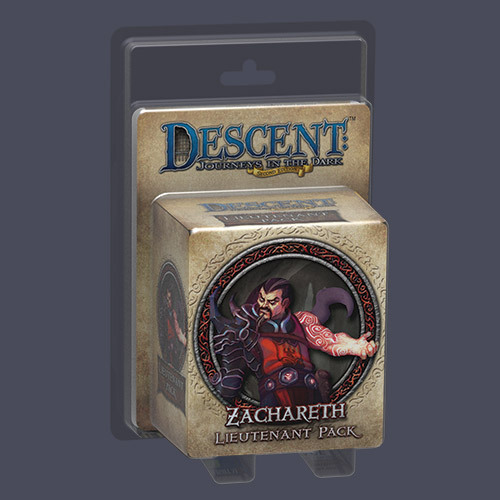 The Zachareth Lieutenant Pack features a detailed plastic figure that places its deadly operative, the core game's primary protagonist, on equal footing with Terrinoth's champions. Moreover, it includes a plot deck and rules that allow the overlord to pursue devious new strategies, inserting the evil baron into any quest as a devious agent bent on harrying the heroes at every turn!